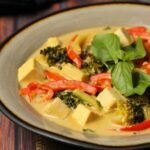 Vegan Green Curry, Creamy and Spicy! We recently took a little holiday, just a week, to a small seaside town in South Africa. We already live in a small seaside town (seriously, there is only one traffic light in this whole town!) but we just can’t get enough of the small town vibes you know what I mean? So we booked the whole week in a bit of a fancy hotel and I thought it was going to be grand. But something I was not at all prepared for and did not account for was that there was barely any vegan food to be had in this little town! Pretty much nothing in our hotel, and very little in the rest of the town! Since I already live in a little town that has quite a lot of good vegan options I thought other little towns would surely be the same, but this one was not! If we had stayed in a self catering place it would have been fine because the shops had everything, it was just the restaurants that were seriously lacking. 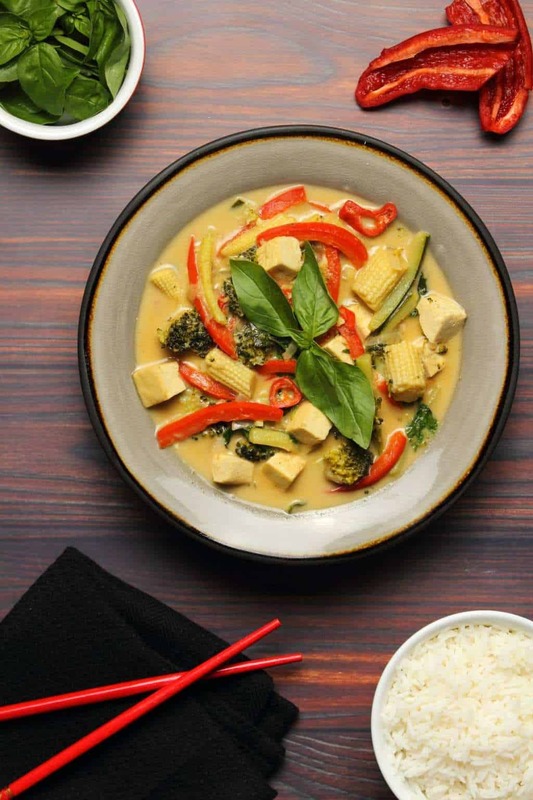 So we basically spent the whole week eating vegan green curry. Okay, there were a couple of other things we ate, but it was mostly green curry. There was a restaurant that offered a delicious vegan green curry with tofu so that was our number one option for the whole holiday. And if you MUST eat one thing for a week? Well then vegan green curry is a pretty good choice. When we got back from holiday I had to take a bit of a break from green curry, but just a few weeks later and I was craving it again. It’s really easy and quick to make. You can have it the super spicy way or the mild way, whatever you prefer. We used 3 tablespoons of green curry paste in this curry and it was the limit of spiciness for me! But I’m a lightweight when it comes to spicy things. Though I have sweated over plenty a hot curry in Thailand, hot food is not my preferred option. I like things to be mild. 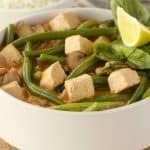 If you like the really spicy stuff then chances are you’ll want to use more than the 3 tablespoons of green curry paste. 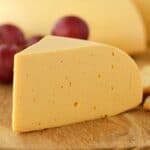 But if you like things mild, then maybe go with just 2 tablespoons. The 3 that we used is really straddling that line between mild and really freaking hot! 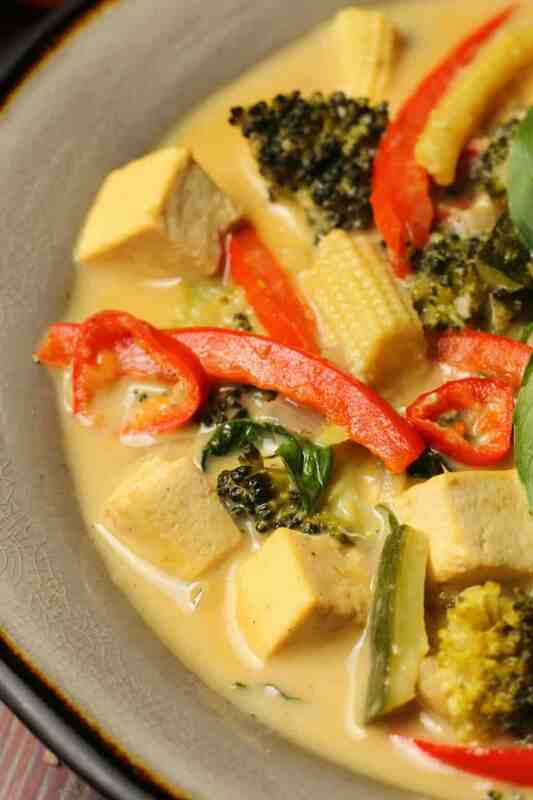 We added tofu to this vegan thai green curry, but if you’re not particularly a tofu fan you could leave it out. 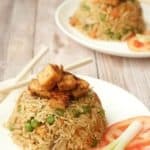 The tofu isn’t flavored or marinated or fried or baked or anything in advance of being added to the curry, it’s just really plain. 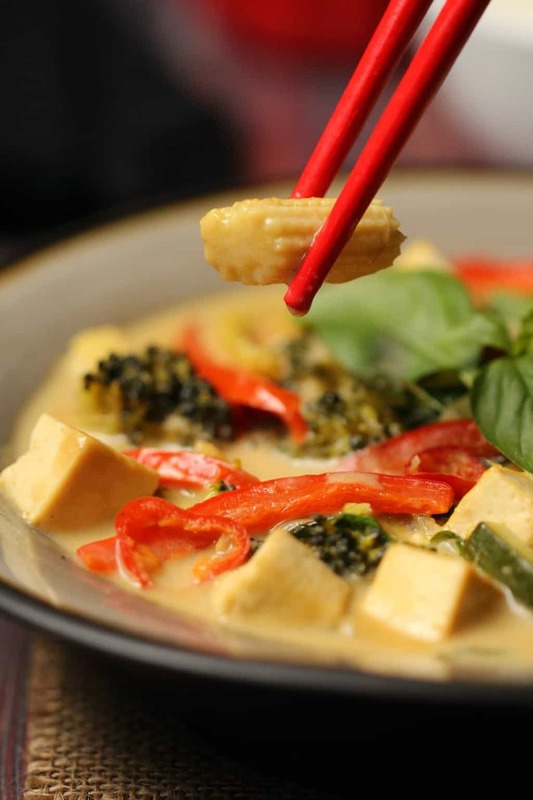 This is typically how tofu is added to Thai curries. On all our travels in Thailand it’s usually been plain tofu added to the curries, without being first fried or marinated or spiced. But we love tofu so this totally works for us. 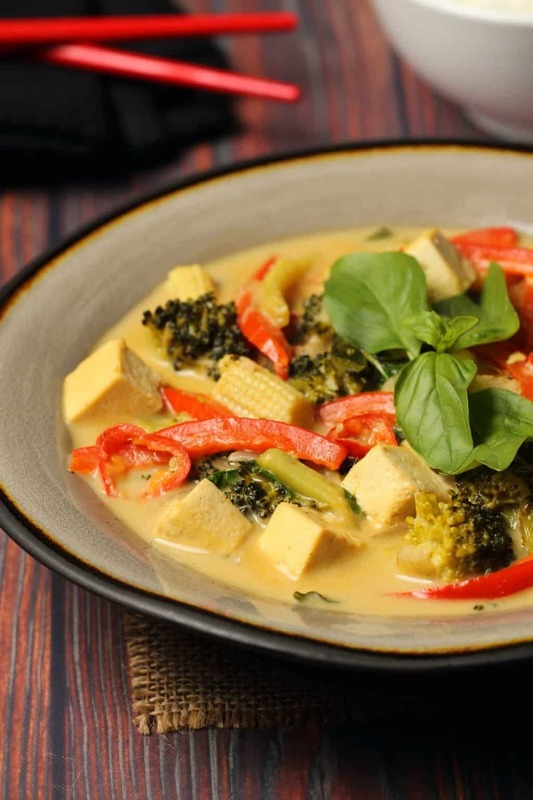 Baby corn, broccoli florets, zucchini and red pepper provide the lovely colors in this dish, and fresh basil added in at the end really makes the flavors pop. Serve it over basmati rice or cauliflower rice if you want it to be lighter. 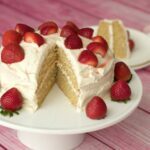 Leftovers keep very well in the fridge and can be reheated the next day. 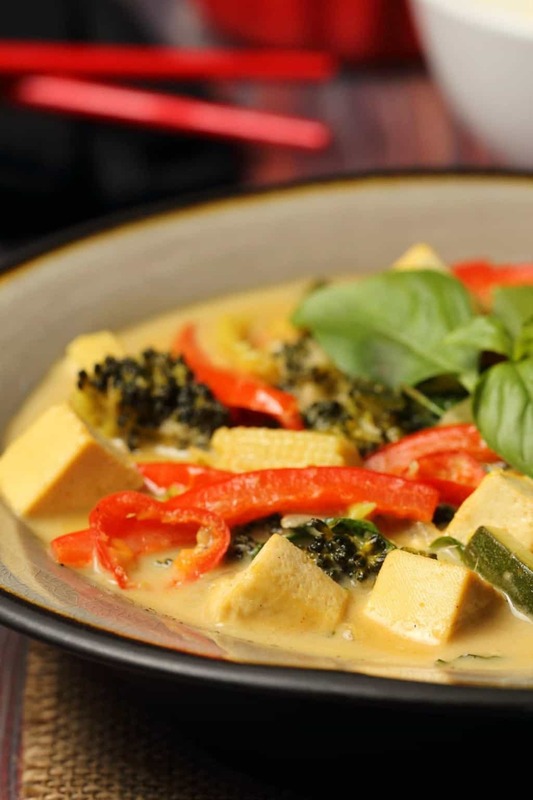 So let us know what you think of this vegan green curry in the comments and please rate the recipe as well. Thanks! 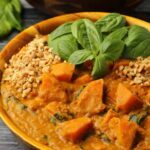 Sign up to our email list before you go, you’ll get an awesome recipe ebook containing 10 delicious vegan dinner recipes (entirely free) and you’ll be the first to know when new recipes are posted to the blog. 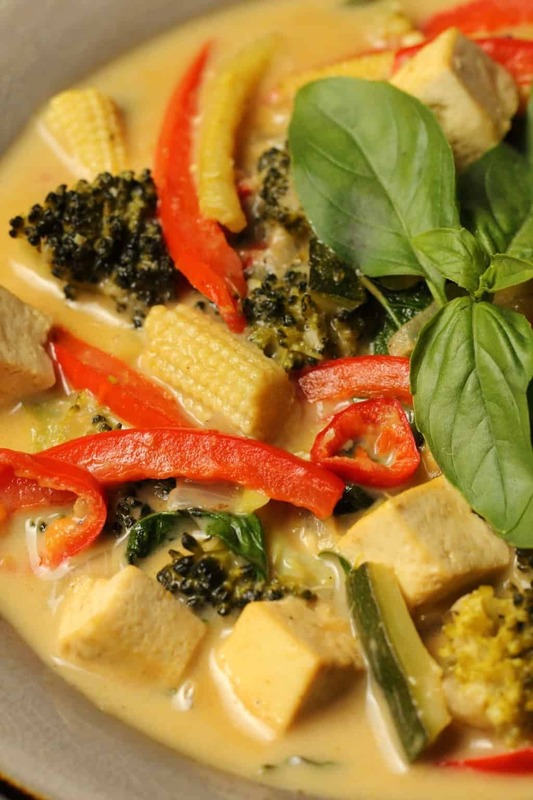 Creamy and deliciously spicy vegan green curry. 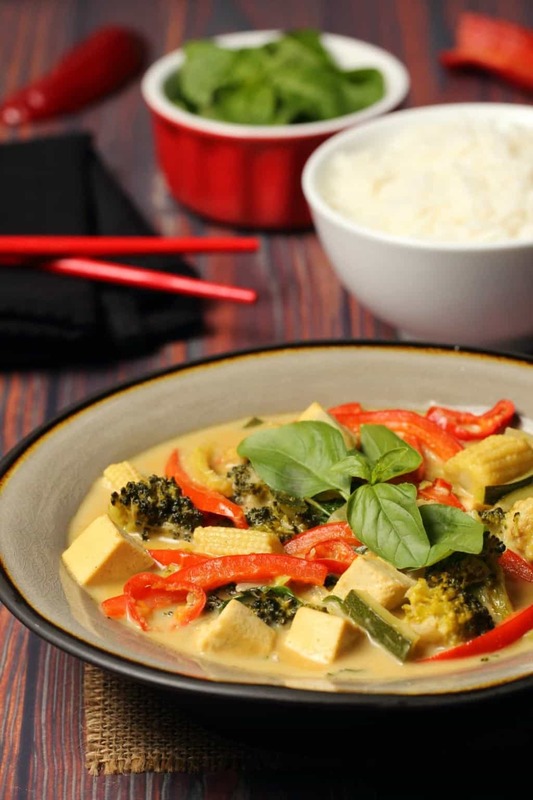 This veggie-packed Thai green curry is wonderfully rich and satisfying and super easy to make. Press the tofu using a tofu press or by placing it on a plate with another plate on top of it and then putting something heavy on top like a heavy pot. Leave the tofu to press for around 15 minutes while you prepare the other veggies. When the tofu is pressed cut it into cubes. Add the onion, crushed garlic, minced ginger, sesame oil and green curry paste into a pot and sauté until the onions are softened. 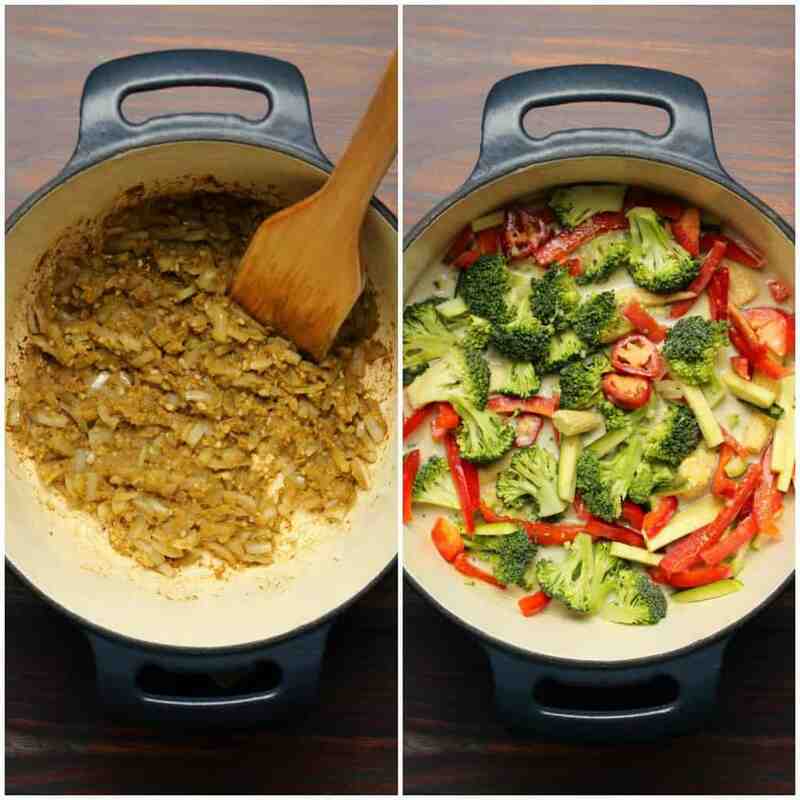 Add the coconut milk, baby corn, broccoli, zucchini, red bell pepper and red chili peppers. Simmer until the veggies are softened but still firm. Add in the tofu cubes and let them cook for a couple of minutes. Then turn off the heat and add in the fresh basil and coconut sugar and stir in until the basil is wilted. Serve with basmati rice or cauliflower rice and some fresh basil leaves. 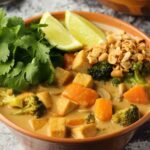 *Use 2 tablespoons of green curry paste for a mild curry, 3 tablespoons to be pretty hot and more if you want it really hot. *Remove the red chilies from the curry before serving if you want to avoid a very spicy surprise! If you like hot things then leave them in. 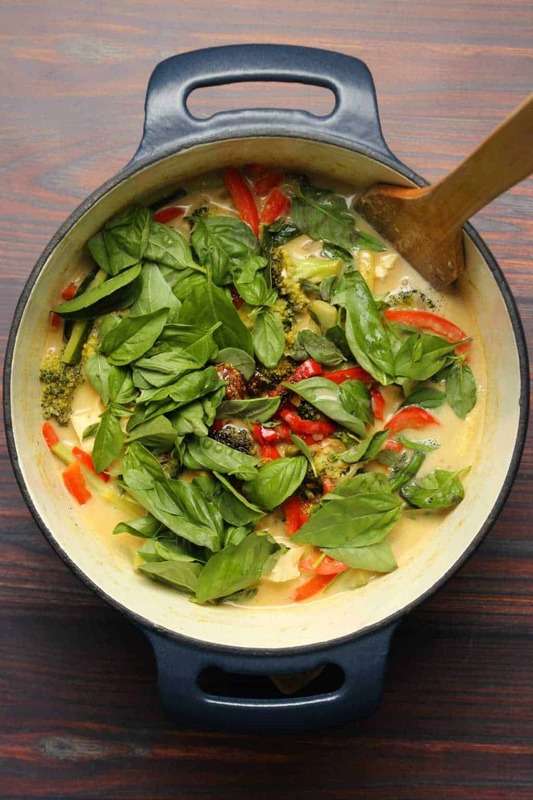 *Nutritional information is for green curry only and does not include rice. I usually add vegan fish sauce plus a small amount of sugar to green curry to enhance the taste. In such a case the salt should be omitted. 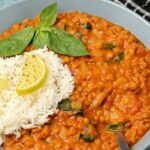 Hi, came across your page when I googled “Lentil soup recipes”, and now I’m going to make this curry as well as the soup! Hopefully they will both work out. 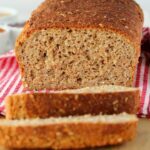 I love the simplicity of these recipes, as I am no fancy cook – have neither the time nor the patience so your recipes are perfect! Loved this and so did my family. Thanks for the tips about the amount of green curry paste to use, we like it on the milder side so used 2 Tbsp and it was perfect! 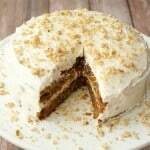 Thanks so much for the great recipe. 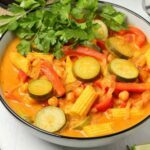 Hi, I searched for Vegan Thai Curry as all the pastes we’ve seen have fish oil in… Can you recommend a brand of one we can find in UK that doesn’t contain fish oil?